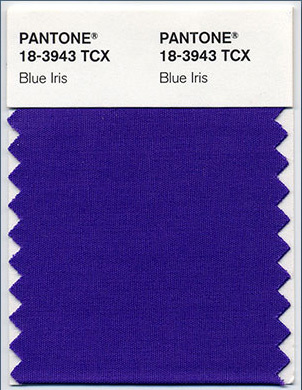 From a color forecasting perspective, we have chosen PANTONE 18-3943 Blue Iris as the color of the year, as it best represents color direction in 2008 for fashion, cosmetics and home products," explains Leatrice Eiseman, executive director of the Pantone Color Institute®. "As a reflection of the times, Blue Iris brings together the dependable aspect of blue, underscored by a strong, soul-searching purple cast. Emotionally, it is anchoring and meditative with a touch of magic. Look for it artfully combined with deeper plums, red-browns, yellow-greens, grapes and grays. Blue Iris satisfies the need for reassurance in a complex world, while adding a hint of mystery and excitement. This color can cast spells, touch your heart, and should also apparently win the Presidency and the Oscar... oh, and I think I want to marry it. Sorry to tease Pantone; it just means I like you.